we offer a variety of services that fit exactly what you need to relax. Looking for the perfect gift? Give someone the treat of visiting Swan Cove! Gift cards can be purchased online and mailed to the recipient. Become a member of our exclusive community and benefit from monthly discounted facial and massage services. Focus on your self-care without worrying about your wallet. Come to Swan Cove to experience a tropical escape. On a heated table, your therapist will begin with a scalp massage and a warm towel behind your neck. Then, using a coconut cream, lighter or deeper pressure can be used to address any areas of tension throughout the body. A foot scrub will have your toes looking beach ready, then to top it off, your therapist will glide hot stones along your back to have you feeling warm and relaxed. Book our new Tropical Massage and escape to paradise today! Soak in powerful green tea antioxidants to preserve your skin and enjoy the antimicrobial, antibacterial, and anti-fungal properties of lemongrass from this month's featured pedicure! Book your Green Tea Lemongrass Pedicure today! Learn about our Facial Club here. Learn about our Back to Back Massage Club here. Dress your massage in the rich scents and healing powers of pure essential oils. Our exclusive Refresh! blend mixes lavender, marjoram, vetiver, and spearmint to perfectly calm your mind and lift your spirits. ﻿This massage experience is exclusively available at Swan Cove! Thank you for voting us BEST OVERALL SPA, FACIAL & MASSAGE! 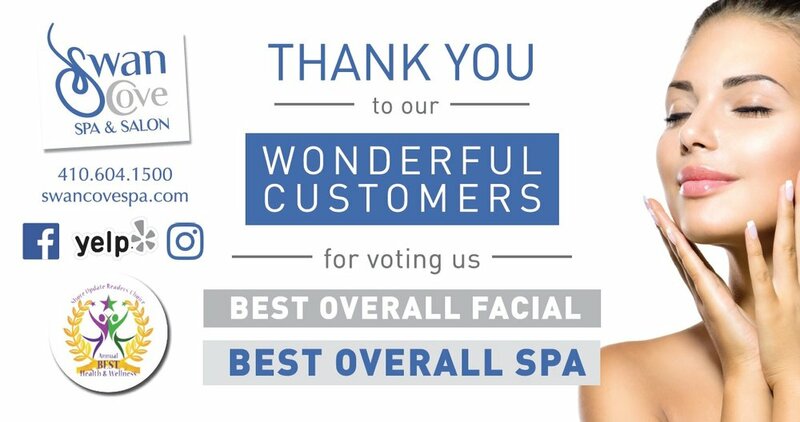 Thank you to our wonderful customers for voting us best overall facial & spa in the Shore Update's Health & Wellness awards! Active duty military and first responders receive a 10% discount (with ID) on any service, retail or gift card purchase. Thank you for your service! Take a look inside Swan Cove! Want to receive the latest info on specials and updates from us? Make sure to subscribe to our newsletter by clicking the subscribe button below!